Much of the sentiment and global market data continues to come in on the positive side of the ledger. 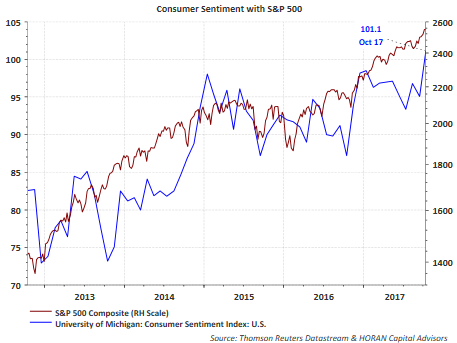 Friday's University of Michigan Consumer Sentiment jumped six points to 101.1 for October and is the highest reading in thirteen years. As reported by Econoday, "The expectations component is up nearly 7 points to 91.3 with the component for current conditions posting a nearly 5 point gain to 116.4." In reviewing the Global PMI's for Manufacturing, as of the end of September, the below table shows all of the PMIs are in excess of 50 which suggests improvement versus deterioration in the manufacturing sector. 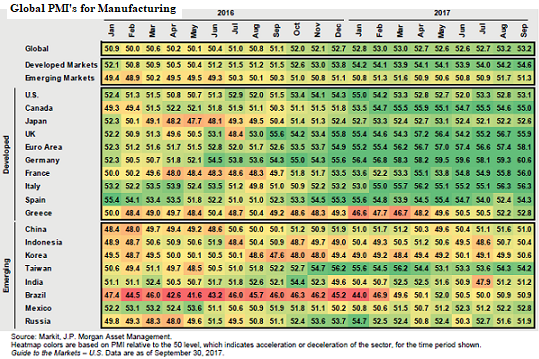 PMI's are leading indicators with health in the manufacturing sector providing insight into sales, employment, etc. The common surveyed questions center on new orders, manufacturing output, employment, suppliers' delivery times and inventory. The positive sentiment and economic data has translated into positive equity market returns around the world. All of the 45 country Exchange Traded Funds (ETFs) at the following link are showing positive returns year to date through October 13, 2017. The economy is not the market and vice versa; however, the positive sentiment and positive economic data currently being reported is translating into higher equity market prices. The lack of market volatility is certainly something that will not persist forever. Maybe the Fed's desire to reduce its balance sheet will result in higher equity market volatility. A correction or pullback near term would be healthy, noting the average intra-year pullback is just over 14%.